With Qustodio you’ll have more information to help protect your kids against the growing number of serious online issues such as viewing inappropriate content, cyberbullying, cyberpredators and screen addiction. With their online dashboard and Parents’ app you’ll be able to see how your child uses devices, apps and the web. Premium Features, your best ally. You can start with a free account and upgrade to the premium account for all of these helpful features. Works on most popular platforms such as desktops, laptops, tablets and smartphones for iOS and Android. To learn more GO HERE. 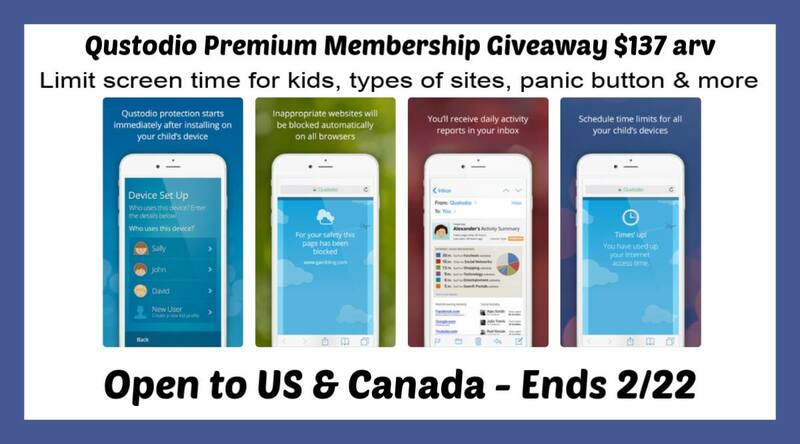 One lucky reader will win the large premium membership that protects up to 15 devices for one year, a $137.95 value! Enter on the rafflecopter below and good luck. I would use it for protecting my boys from inappropriate content and cyberpredators (those are the things I worry the most). I like that the small more affordable plan is for 5 devices (more than enough for me).